All transactions are safe and secure with a reliable history in online purchasing behind each of our associates. 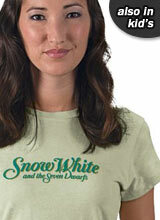 Buy the Snow White Logo t-shirt to own Snow White clothing and merchandise. Can't decide who you like best? It is definitely a hard decision to pick between Dopey, Bashful, Sleepy, Sneezy, Doc, Grumpy, Happy, Snow White, Prince Charming and even the wicked Queen so we decided to make it easier for you. This simple Snow White shirt features the movie logo and is available in a variety of styles and colors for men, women and children. Now you just have to pick the cut that suits your lifestyle and you are ready to roll. If you want to share the magic, then grab a Snow White doll or plush from below for a friend. It is always nice to be thought of. In addition to the Snow White Logo tee above, browse the Snow White Clothing Gallery for more apparel like men's and women's clothes, kids shirts or hoodies.